Just a couple of days ago, I was talking about the coming of spring; flowers blooming, birds chirping and here we are in the midst of another polar vortex. When I looked at the weather this morning and saw -6 Fahrenheit, I was a little bit shocked to say the least. I thought the coming of March was going to warm things up for us, but the news this morning said that in fact we can anticipate a cold month ahead. In light of this devastating news, I needed some chocolate. 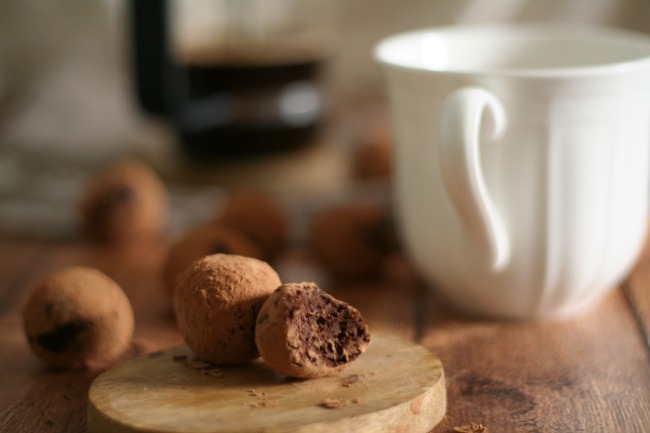 This truffle recipe is so simple to make. I realize that I say that a lot about the recipes I share and that’s because simplicity is an important factor for me! Fresh, naturally sweet dates combined with dark cocoa, create something extraordinary – that is, a decadent treat that is healthy for you. To make this recipe your own, you could add a little bit of cinnamon, cacao nibs, dried cranberries, liquor…etc. However you enjoy them, they are a good remedy for the winter blues that’s going around. We braved the cold earlier this week in Montebello, QC – where we stayed at Chateau Montebello and visited Omega park to see beautiful animals in their natural habitat, amidst a great snow fall. There’s something so majestic about deers and elk, don’t you think? Aiden was taken with one particular elk, that he kept feeding carrots to. He would tease him with the carrots by taking bites of it, then offering the elk a bite and then pulling the carrot back again. You can watch the video that I posted on Google +. It’s pretty adorable. 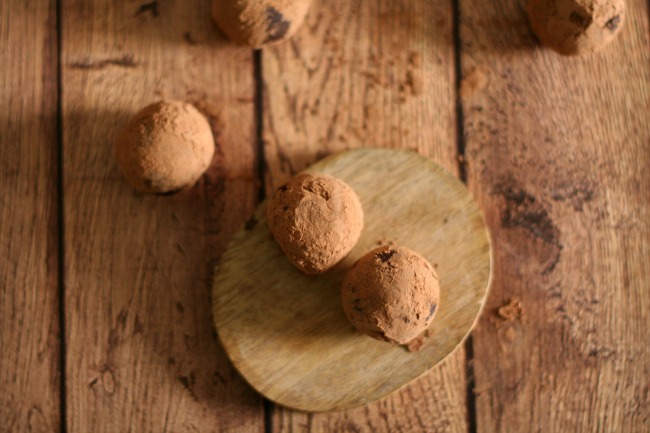 Decadent raw chocolate truffles made with sweet medjool dates and rich natural cocoa powder. An indulgent treat that you can feel good about enjoying. 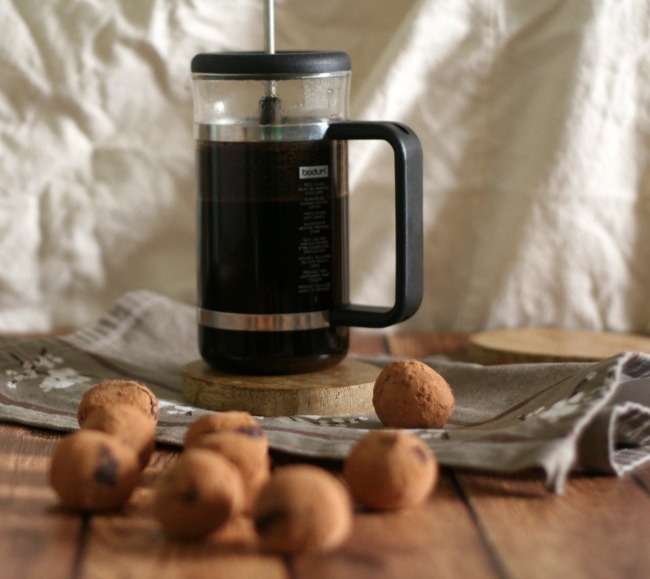 Place all ingredients in a food processor, using 3 Tablespoons of hot espresso to begin with. Process for about two minutes or until a smooth, workable consistency is reached. 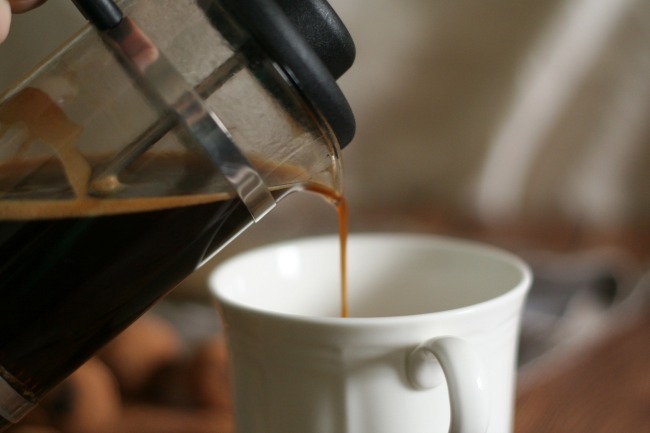 If the mixture is too dry, add in an extra Tablespoon of hot espresso. 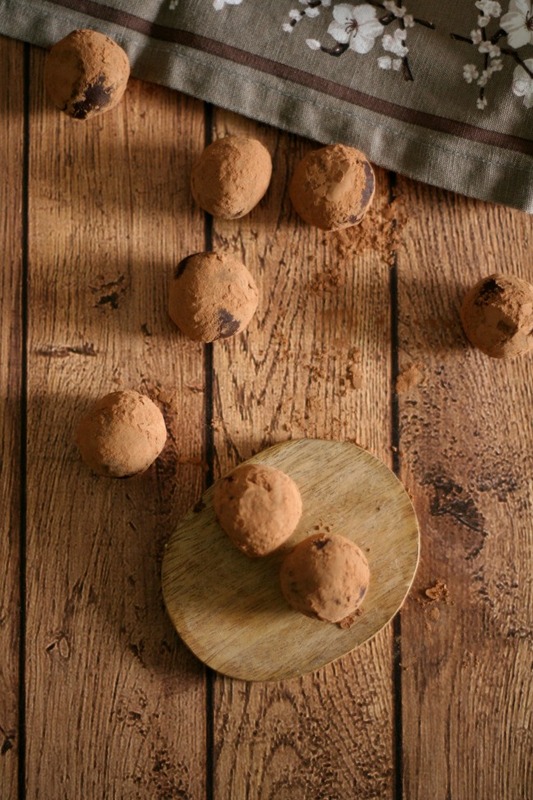 Using a teaspoon, scoop out mixture and shape into balls. Then roll in cocoa powder and place on a plate. Continue until all of the mixture is finished. If you don't mind them warm (I don't) - you can eat straight away. 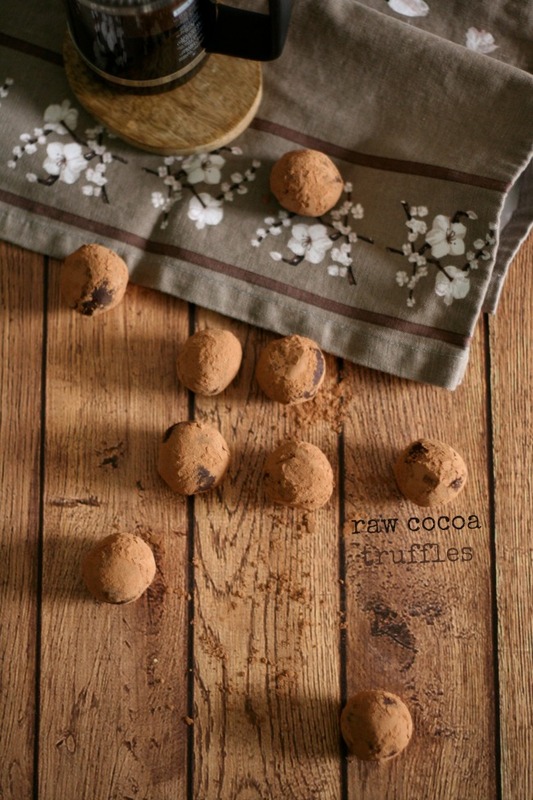 Try adding 1/4 cup of nuts, or a Tablespoon of peppermint extract, for a dark chocolate mint truffle. You could also add a little bit of your favourite alcohol for a special dessert. If you want a sweeter truffle, add a little bit of pure maple syrup to the mixture. This weekend, as many weekends this winter – we will be stocking up on hearty food, movies, crafts and staying inside, because that’s just about the only thing you can do in weather as cold as this. If you have any family movie suggestions please feel free to leave them in the comments, I’m never sure what to rent!! Thank you Audra!!! 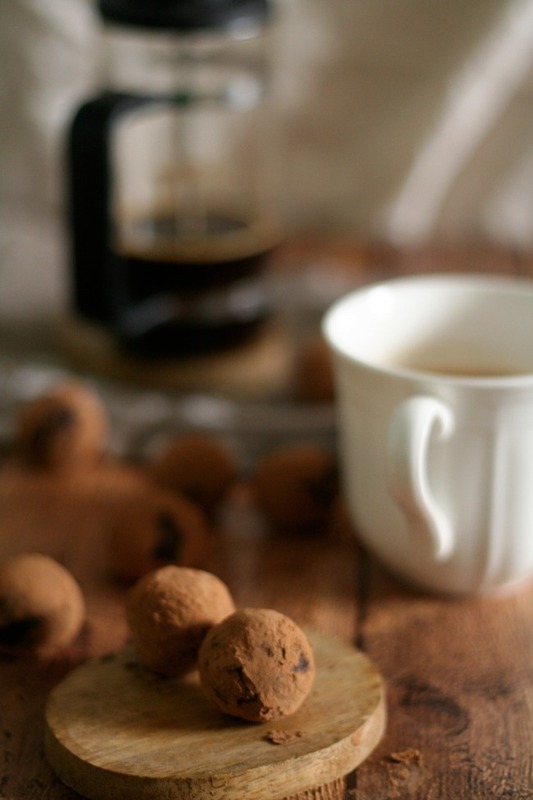 I love no-bake truffles and cookies…there are so many variations and they are a nice treat/snack to have on hand. Yum! Decadent but full of antioxidants! I must try these. I know this might be a bit of stretch but I really think I NEED some of these today. It will help with the coming snow!